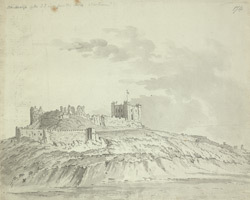 A south-east view in ink of Bamburgh Castle in Northumberland, taken from the sands. In this drawing the Norman square keep can be seen and a part of the castle curtain walls. There was previously an Anglo-Saxon fort on the site, but the Normans built the stone building that is now recognisable as the castle. Although the castle was besieged many times, for centuries it remained uncaptured until the Wars of the Roses (1453-1486). From the late 16th century until the mid-18th century the castle belonged to the Forster family, but upon their bankruptcy it was sold off to the Bishop of Durham, Lord Crewe.